The director frames a shot. Mark Yerkes grew up in the entertainment business. His parents, Bob and Dorothy, were flying trapeze performers, but Mark learned all the varied talents associated with circus life, including trampoline, tumbling, clowning and teeterboard. It was natural then that Mark would follow his father's footsteps in becoming a Hollywood stuntman. He has been a member of the Screen Actors Guild for nearly four decades; and, within the film business, he also learned how to write for stage and screen, produce video and film, direct, do lighting and a myriad of other skills necessary in his ministry today. 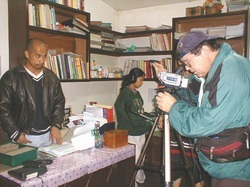 His book "Making Your Film for Less, Outside the U.S." was the launching pad that started his movie-making in the Philippines. Mark's ministry of Christian storytelling was recognized after several years of ministry, and he was ordained an Evangelist in 2009. His greatest joy is in serving his Lord and Master Jesus Christ by bringing the gospel of eternal salvation to those who are lost. 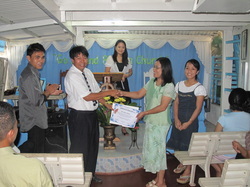 Tess is awarded for her help in church-planting. Tess Yerkes is the perfect match for Mark. She has a Bachelor of Theology degree from Metropolitan Bible Baptist College in Manila, and she has recently completed a second degree program on Education, though she already has over a decade of experience as a preschool teacher. She is grateful to God for giving her a meaningful life in service to Him, especially for being intimately concerned with her spiritual growth. Both Tess and Mark's lives have changed wonderfully since their marriage in 2003. 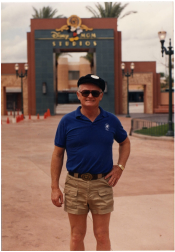 Bob Yerkes is pleased to be recognized as the oldest "still working" Hollywood stuntman, but he is even more pleased to be part of the many works God is doing in the entertainment industry throughout the world. He is on the boards of directors for several ministries within the entertainment umbrella, which includes his participation as Executive Producer on most of the Videoparables productions. Among his proudest accomplishments is his part in re-erecting the lighted cross that stands on one of the hills above Hollywood. This cross has been there so long that it is shown on the emblem for the City of Los Angeles, yet some people who hate the cross (and what it represents) tore it down. Bob and other concerned Christians made sure it was put back up because they want Hollywood to know there is a beacon of hope, no matter what sins one has committed.